This week Trump continued his ramped up level of lying and unhinged behavior as he once again made a spectacle of himself on the world stage at the NATO Summit in Brussels. Trump continued his pattern of hostility towards allies, while maintaining an overtly collegial tone towards Putin, even as the Mueller probe indicted 12 members of Russian military intelligence on charges of hacking and disrupting the 2016 U.S. election and Director of National Intelligence Coats warned, “warning lights are blinking red” for further attacks. At home, Trump and his allies are taking every possible step to discredit the Mueller probe and attempt to preview FBI information. This week Trump continued his hostility towards the free press and his attacks on free markets, while taking steps to consolidate power. Important developments, like Trump’s executive order doing away with non-partisan administrative law judges and the confirmation of Brian Benczkowski to a top Justice Department position, got very little notice in the chaos. Trump views immigration as the winning issue for Republicans in the midterms. This week he continued his indifference towards the plight of separated migrant families, while his regime quietly carries out inhumane and alarming tactics to make America more white. Trump also preached his anti-immigrant message on his trip abroad, while hundreds-of-thousands marched in protest of his visit and message. WAPO released a fact check of Trump’s Montana rally in Week 86 and found of his 98 factual statements, 76% were false, misleading, or unsupported by evidence. The Toronto Star charted a sharp increase in the number of daily lies Trump is telling, starting in Week 85 and continuing. After his Moscow trip, Sen. Ron Johnson told the Washington Examiner on election interference, “We’ve blown it way out of proportion.” He also questioned the effectiveness of U.S. sanctions on Russia. On Sunday, the British woman who in Week 86 was exposed to the Russian nerve agent Novichok died. Stephen Miller was confronted after picking up $80 of takeout sushi, when a bartender followed him out and yelled “Stephen,” then raised both middle fingers and cursed at him. Miller threw the sushi out. On Sunday, NYT reported the Trump regime stunned world health officials this spring when at the United Nations-affiliated World Health Assembly the U.S. delegation opposed a resolution encouraging breastfeeding. The U.S. delegation, embracing infant formula manufacturers, threatened Ecuador that if they refused to drop the resolution, Washington would unleash punishing trade measures and withdraw crucial military aid. On Tuesday, BuzzFeed reported Sinclair Broadcasting is planning to launch a free TV streaming service which would house a 24/7 channel, creating a new competitor for Fox News. On Sunday, Giuliani told “This Week” he advised Trump not to publicly discuss pardoning Michael Cohen until the investigation concludes, but does not believe Trump should rule out a pardon in the future. On Monday, Trump nominated Brett Kavanaugh to the Supreme Court. In 2009, Kavanaugh wrote presidents should be immune from criminal investigations and prosecutions, as well as personal civil suits, while in office. On Sunday, Sacramento Bee reported 91 year-old Rodolfo Rodriguez was beaten with a brick on July 4 and told, “Go back to your country” by a mother after bumping into her toddler daughter on the sidewalk. On Tuesday, the mother, 30-year-old Laquisha Jones was arrested by the Los Angeles County Sheriff’s Department and charged with assault with a deadly weapon. Rodriguez has been hospitalized since the attack. A Cook County Forest Preserve District officer ignored her calls for help. A police report of the incident did not include any mention of the woman’s request for assistance. On Thursday, prosecutors filed the two Class 3 felony hate crime charges against Trybus. The officer was initially reassigned to desk duty pending the investigation. He resigned on Thursday. On Thursday, the Boston Globe reported a Martha Vineyard’s bus driver was fired after driving past a passenger trying to flag the bus down, and later admitted it was because the passenger was black. In Columbus, Ohio, a woman called the police on a 12 year-old black boy who was helping his mother deliver newspapers. The police who showed up and asked what they were doing said race did not play a role. On Monday, Politico reported Illinois Gov. Bruce Rauner disclosed earnings from a fund that owns Correct Care Solutions, a for-profit healthcare provider that profits off ICE detention center contracts. On Tuesday, WAPO reported Giuliani continues to work for foreign clients, both individually and through his security firm while serving as Trump’s attorney, a departure of standard practice and possible conflict of interest. Giuliani works with Brazil, Colombia and other countries, and delivers speeches for dissident groups as he did in Week 86, but he has never registered with the Justice Department on behalf of his overseas clients. Giuliani lobbied Trump to promote his son Andrew, a low-level White House aide, before becoming Trump’s attorney, and according to sources, continued to lobby Trump after he became Trump’s attorney. On Thursday, WAPO reported Kushner does not have the security clearance level required to review some sensitive materials, which could complicate his ability to handle a foreign policy portfolio. In late May, Kushner was granted only “top secret” status. He has not yet been approved to review “sensitive compartmented information,” which involve U.S. intelligence sources and surveillance methods, by the CIA. NYT reported Brookfield Asset Management is close to completing an investment of up to $700 million in the Kushner Cos’ 666 Fifth Avenue, a boon to the Kushner family for this over-leveraged property. Simultaneously, a unit of Brookfield is awaiting approval from the Trump regime’s Committee on Foreign Investment for its acquisition of the nuclear-power company Westinghouse Electric. Brookfield is headquartered in Canada. WAPO reported last week Commerce Secretary Wilbur Ross informed the Office of Government Ethics of a tardy sale: on June 11 he sold shares of Air Lease Corp., saying he had overlooked the shares held in a separate account. On Friday, a report produced by Senate Democrats revealed Novartis sent Cohen a list of proposals to lower drug prices. Several proposals were included in the Trump regime’s “blueprint” to lower drug prices in May. On Sunday, AP reported migrant children as young as 1 year-old separated from their parents under Trump’s “zero tolerance” policy are appearing before immigration judges and going through deportation proceedings. Hundreds of separated children are appearing, many of whom do not know why their family fled. Some will be reunited in Guatemala, Honduras, or El Salvador, the violence-plagued countries they escaped. Trump’s executive order was based on detaining families indefinitely. The judge suggested the regime reconsider “their current blanket policy of family detention,” and instead reinstate prosecutorial discretion. Johnson said, “These are human beings… It boggles my mind,” adding “I just would assume…the reunification would have been a relatively simple matter.” Johnson said he may hold hearings if questions are not answered. On Tuesday, the court deadline for the Department of Health and Human Services to reunite migrant children under 5 with their parents, just four out of 102 children had been reunited according to the joint filing submitted by the government and the ACLU. On Monday, BuzzFeed reported pregnant women in immigration detention are often denied adequate medical care. Some women have been shackled around the stomach while being transported between facilities. Advocates say at an ICE run facility in Texas, an officer promised to bring pregnant women to off-site medical professionals but never did. A woman from El Salvador miscarried due to lack of care, and was left to bleed out. The Salt Lake Tribune editorial board wrote our treatment of refugee children is a national disgrace, contrasting the regime’s actions to the rescue of 12 children and their soccer coach in Thailand. On Tuesday, NYT reported migrant toddlers who were recently reunited in Phoenix after months of separation did not recognize their mothers. On Tuesday, Texas nonprofit RAICES announced it will symbolically offer the government $20 million to post bonds for 2,500 separated families, and demanded immigrant mothers be released from detention centers. KETV-7 reported posters have been spotted around the Omaha metro area which read, “It is your civic duty” to report “illegal aliens,” adding “they have broken the law.” ICE claimed they had nothing to do with the posters. Miami Herald reported Trump’s DOJ is seeking to denaturalize Norma Borgono, a 63-year-old secretary who immigrated from Peru in 1989, volunteers weekly at church, and raised two children on $500-week. Borgono had a minor role in a fraud scheme over a decade ago. She worked two jobs, she paid off her restitution and was relieved of her sentence early. The DOJ rarely pursued such cases in past decades. In addition to Citizenship and Immigration Services denaturalization task force in Week 86, DHS plans to spend $207.6 million to look for such cases and ICE will be hiring more than 300 new agents and scores of staffers. On Tuesday, the Daily Beast reported that according to a shelter in El Paso, TX that houses women, government officials told four immigrant women they must pay for their DNA tests in order to be reunited with their children. On Wednesday, ABC News reported Margarito Silva and Concepcion Barrios were taken into custody by ICE when they went to visit their pregnant daughter and son-in-law who live on Fort Drum in New York. The couple presented a New York City identification card for entry, which had worked in the past, and their Mexican passports. The couple has no prior criminal record and no prior interactions with ICE. On Thursday, Customs and Border Protection alleged in a letter that NYC mayor Bill De Blasio crossed the border illegally on foot while visiting a detention facility for youth in El Paso, Texas. A report by tech watchdog Electronic Frontier Foundation found some shopping malls in California are scanning license plates and sending that data to The Irvine Company, a surveillance vendor that works with ICE. On Friday, San Diego federal justice Dana Sabraw praised the government’s “substantial” efforts in reuniting 57 of the 103 migrant children under 5. The court deadline had been Tuesday. With the next deadline looming, the judge ordered the government to carry out an orderly process for the larger group, estimated at 2,551 older children over 5. The government says it will reunite 200 children a day. The judge also signaled he was inclined to accept the ACLU request that the government shoulder the travel costs for reuniting families, even though the government attorney called it a “huge ask” not in the budget. On Monday, Trump’s personal driver for 25 years, and registered Republican, Noel Cintron sued the Trump Organization for overtime, saying it didn’t pay him overtime and raised his salary only twice in 15 years. On Tuesday, Trump tweeted, “Just talked with Pfizer CEO” and HHS secretary Alex Azar, saying, “Pfizer is rolling back price hikes.” Pfizer subsequently announced it would defer raising prices. On Tuesday, Trump signed an executive order giving agency heads greater discretion over hiring and firing administrative law judges, replacing non-partisan career judges, who make legal rulings on regulatory actions. The order will make it easier for the Trump regime to compel the 2,000 regulatory judges to follow its anti-regulatory policies, or to fire them if they do not, allowing Trump to further consolidate power. On Tuesday, Trump threatened to broaden his trade war with China, announcing a list of $200 billion tariffs on Chinese goods. The tariffs will undergo a two-month review process. On Wednesday, the Senate passed a nonbinding measure 88-11 asserting “a role for Congress” when Trump imposes tariffs. The measure has no teeth, and GOP advocates said there wasn’t backing for a strong bill. On Wednesday, the Senate confirmed Brian Benczkowski as director for the Criminal Division of the Justice Department, which oversee parts of the Mueller probe and Cohen investigation. Benczkowski has no prosecution experience and has never tried a case. He told lawmakers he supports Mueller’s investigation, but would not promise to recuse himself from issues involving Russia. Benczkowski was nominated by Trump in June 2017, but his confirmation was stalled because he represented Alfa Bank, a Russian bank, even after it was a subject of the FBI’s probe of the Trump campaign’s ties to Russia. A new bill introduced by House Republicans titled the “Unmasking Antifa Act of 2018,” says Antifa activists could be jailed for up to 15 years for wearing masks. On Thursday, Marc Short, a top Trump aide and director of legislative affairs, resigned. Short declined to comment on the reason. On Thursday, the NYT reported a Federal Emergency Management Agency report found the agency was sorely unprepared for 2017 hurricane season, which was the most destructive on record. The report, scheduled to be released Monday, was made public after the NYT obtained a draft. The final version removed a paragraph noting that FEMA’s hurricane plans had so underestimated disaster impacts. The report found FEMA had thousands fewer workers than it needed, and many of those it had were not qualified to handle major catastrophes. FEMA had to borrow workers from other agencies to try to keep up. As Puerto Rico braces for hurricane season, 10 months after Hurricane Maria, roughly 1,000 households are without power, and the management of the island’s government-owned electric utility, Prepa, is in turmoil. On Tuesday, 70 education leaders sent a letter to Education Secretary Betsy DeVos and Attorney General Jeff Sessions, asking them to not remove Obama-era guidance meant to eliminate racial disparities in school discipline. On Tuesday, the Trump regime decreased grants for grassroots groups that help Americans get Affordable Care Act insurance from $62.5 million in 2016 to $10 million for the enrollment period that starts in November. Also new, instead of choosing solely between ACA plans, the groups receiving grants will now also offer health plans that bypass ACA’s consumer protections and required benefits. On Thursday, watchdog group Sunlight Foundation reported the Trump regime removed entire sections about the ACA from the official Medicaid.gov site, its hub for the Center for Medicaid and CHIP Services. On Thursday, the Daily Beast reported a database known as the National Guideline Clearinghouse, which includes 20 years of critical medical guidelines, has been scheduled by HHS to “go dark” on July 16. On Tuesday, Lisa Page canceled her appearance before the House Judiciary Committee for Wednesday. Her attorney said they were not shown any of documents that were subject of the hearing after waiting more than three hours. On Wednesday, Speaker Paul Ryan threatened Page with contempt charges, saying the House will “do what we need to do to protect this branch of government” and that he stands behind committee chair Robert Goodlatte. On Friday, Page met with the House Judiciary Committee privately. Without offering specifics, Republican lawmakers claimed she provided new information that further convinced them of political bias at the FBI. On Thursday, Strzok went before the House Judiciary Committee in a 9.5 hour contentious hearing that turned into a circus-like setting with insults, fighting, shouting, character assassination, and partisan bickering. Strzok expressed “significant regret” for the way his texts to Page had hurt his family and the FBI. He smirked most of the hearing as lawmakers battled each other, Republicans attacked and Democrats defended him. During the hearing, GOP Rep. Trey Gowdy threatened Strzok with contempt, Louie Gohmert attacked his infidelity and character, Darrell Issa made him read his own texts, and Paul Gosar said he could read Strzok’s body language as a former dentist. On Monday, Madeleine Albright and 15 other former foreign ministers urged Trump in a letter to shore up America’s “deteriorating relationship” with its Western allies, and not ignore the threat posed by Putin. On Tuesday, by a vote of 97-2, the Senate approved a motion of support for NATO on the day Trump arrived in Brussels for the NATO summit, amid concern of Trump’s ambivalence towards the alliance. On Tuesday, Trump told the media as he was leaving for his weeklong trip to Europe that his summit with Putin “may be the easiest” of the meetings he has scheduled. On Tuesday, the Guardian reported that the US embassy in London warned Americans in London to “keep a low profile” during Trump’s visit, saying large demonstrations against Trump could turn violent. On Tuesday, Trump pardoned the Oregon ranchers, Dwight Hammond and his son Steven Hammond who were the inspiration behind the 41-day armed occupation of the Malheur National Wildlife Refuge in 2016. The Hammonds were sent to prison in 2012 on arson charges for a series of fires to hide evidence of killing a herd of deer on their ranch that spread to federal land, and were imprisoned for a second time in 2015. On Wednesday, as the NATO summit got underway in Belgium, Trump launched a clearly planned attack on Germany, saying the country is “a captive to Russia” because it imports much of its energy from Russia. Trump’s comments shocked NATO allies. Norwegian prime minister Stoltenberg was reportedly reduced to spluttering as Trump cut him off after he started to explain that allies have always traded with Russia. Trump also ripped into NATO allies for not having reached 2% of their GDP’s on defense yet, although the guidance is by 2024, and later at a closed-door meeting said allies should instead pay 4% of GDP on defense. On Wednesday, Senate Foreign Relations Committee Chair Bob Corker said Trump’s comments about NATO have been “damaging” to American leadership in an apparent effort to “tear apart” a critical alliance. On Thursday, Trump showed up late to the NATO summit, skipping meetings with at least two world leaders and prompting the secretary general to call an emergency meeting. After the meeting, Trump recommitted to NATO, but warned uneasy allies “I’ll do my own thing” if their spending did not rise quickly enough. Allies also remain concerned about Trump’s ties to Putin. Politifact reported the statements made by Trump during the NATO summit news conference related to NATO spending, Wisconsin, U.S. farmers’ export to the EU, and other items were mostly false or misleading. On Thursday, during his first visit to the UK, while PM May rolled out the red carpet to Trump, a Murdoch-owned London tabloid published an explosive interview in which Trump blasted May’s Brexit compromise. In the interview, Trump also praised May’s archrival, Boris Johnson, as a potential future prime minister, and attacked London’s Muslim mayor, for being soft on crime and terrorism. Trump said May is doing “a terrific job,”and called her “tough” and “capable,” but said she should have taken his advice on Brexit, and continued to praise her main political adversary Johnson. When CNN’s Jim Acosta asked Trump a question, he called the network “fake news,” and instead called on Fox News’ John Roberts, saying, “Let’s go to a real network.” Roberts asked an easy question, Trump answered. NYT fact-checked the news conference and found Trump told 10 lies or exaggerated statements on topics including American troops abroad, NATO spending, and his prediction of the Brexit vote. On Friday, nearly 250,000 protestors marched against Trump in central London. Protestors carried signs, and a giant balloon, which depicts Trump wearing a diaper and carrying a mobile phone in tiny hands. Trump then visited with the Queen of England, where he had many social miscues including walking in front of the queen, walking briskly and ahead of her at times, and shaking hands instead of bowing or curtsying. As Trump was meeting with Queen Elizabeth II at Windsor Castle, most networks went split-screen, and then broke away to coverage of a news conference with deputy attorney general Rod Rosenstein. Rosenstein announced 12 Russian military intelligence officers (GRU) were indicted in the Mueller probe on charges they hacked Democrats’ computers, stole data, and published files to disrupt the 2016 election. The 11-count, 29-page indictment gave granular detail on how the Russian government hackers implanted malware, and spread stolen information DC Leaks, Guccifer 2.0 and others to influence voters. The indictment notes on July 27, 2016, then-candidate Trump said at a news conference, “Russia, if you’re listening, I hope you’re able to find the 30,000 emails.” That same day conspirators attempted to spearphish email accounts used by Clinton’s personal office for the first time. The indictment notes in August 2016, “the conspirators, posing as Guccifer 2.0, received a request for stolen documents from a candidate for the U.S. Congress,” and sent the candidate stolen documents on their opponent. The indictment also says GRU successfully hacked “test applications related to the DNC’s analytics,”and stole that data from the DNC, giving insight into the Clinton campaign’s analysis and plans. Rosenstein said GRU hacked a state election board website and “stole information about 500,000 voters,” They also hacked the computers of a software supplier used to verify voter registration information. On Friday, shortly before Rosenstein’s news conference, Giuliani resurfaced on Twitter for the first time since December 2016. After the indictments, Democrats and Sen. John McCain called on Trump to cancel his upcoming one-on-one summit with Putin. The White House announced Friday afternoon that the summit is still on. As Rosenstein announced the indictment, House conservatives were putting on the final touches on a filing to impeach him. Reps. Mark Meadows and Jim Jordan said they could file the document as soon as Monday. On Friday, director of national intelligence Dan Coats said persistent danger of Russian cyberattacks today was akin to the warnings the U.S. had of stepped-up terror threats ahead of the September 11 attacks. On Friday, Maryland state officials said the FBI informed them that their voter registration system, ByteGrid LLC, was purchased in 2015 by AltPoint Capital Partners, whose fund manager is a Russian. The largest investor in AltPoint is Russian oligarch Vladimir Potanin. The FBI did not indicate a breach occurred. Maryland officials asked the DHS Election Task Force to assist with any corrective action deemed necessary. On Tuesday, Michael Flynn was back in court for the first time since his guilty plea. The judge did not set a sentencing date, but scheduled to receive an update on the case from prosecutors and Flynn’s lawyers by Aug. 24. On Tuesday afternoon, WSJ reported Flynn had taken a new job, launching a consulting firm, Stonington Global LLC with Nick Muzin and Joey Allaham. Flynn’s bio appeared on the company’s website. Stonington will provide consulting and lobbying services for U.S. and foreign clients. Later Tuesday, Flynn’s lawyer said he is no longer joining the consulting firm, and that he did not personally issue a statement. On Tuesday, in an interview on “VICE News Tonight,” Emin Agalarov said he spoke to Donald Jr. three times prior to the June 9 Trump Tower meeting. Donald Jr. told Congress he could not recall. CNN reported Facebook gave Mail.Ru Group, a Russian internet company with links to the Kremlin, an extension which allowed them to collect data on unknowing users of the social network after a policy change. Twitter announced that starting Thursday, the platform will begin removing tens of millions of suspicious accounts in its battle against fake accounts. The company plans to remove roughly 6% of users. On Tuesday, Paul Manafort’s attorney asked the Virginia judge to delay the July 25 hearing, saying the jury pool was tainted by the intense media coverage and Manafort needed more time to review thousands of documents. “Unique privileges” include a private bathroom and shower, a personal telephone and daily access to a workspace where he can meet with lawyer and prepare for trial. The judge did not allow the trial delay. On Wednesday, Mueller’s team also asked the federal court to issue 100 blank subpoenas to potential witnesses in the upcoming Manafort trial. On Thursday, Manafort was moved to an Alexandria jail. Manafort’s attorney tried to prevent the move, which the judge called “surprising and confusing” in light of their complaints. A mugshot was made public. The jail in Alexandria is a past home for spies and terrorists, including FBI agent-turned-Soviet mole Robert Hanssen and Zacarias Moussaoui, the only person tried in a U.S. court for involvement in the September 11. On Thursday, Russian-American lobbyist Rinat Akhmetshin, who attended the June 9 Trump Tower meeting, sued Putin critic Bill Browder, alleging Browder defamed him by labeling him as a Russian intelligence operative. On Thursday, NYT reported the White House ordered that lawmakers be given access to classified information about an informant the FBI used in 2016 to investigate possible ties between the Trump campaign and Russia. FBI files will be available to all members of the Senate and House Intelligence Committees, not just the Gang of Eight. U.S. intelligence and law enforcement officials have expressed concern on broader sharing. On Thursday, a Fox News poll found 53% think Trump is not tough enough on Russia, including 32% of Republicans. Support for Mueller probe is down from 55 approve/27 disapprove in June 2018, to 48/40 now; although 54% say Mueller should take his time, while just 34% said he should wrap it up. On Thursday, shortly after midnight, Stephanie Clifford was arrested after being accused of squeezing patrons’ and undercover police officers’ faces between her bare breasts at Sirens Gentlemen’s Club in Columbus, Ohio. Shortly after, Clifford’s attorney Michael Avenatti tweeted Clifford was performing the “same act she has performed across the nation, adding, “This was a setup & politically motivated.” Charges were dropped on Thursday. On Thursday, Trump’s DOJ filed to appeal the AT&T-Time Warner merger. The deal won approval without conditions from a federal judge in June. Time Warner owns CNN. On Friday, Iceland was elected to the take the spot vacated by the U.S. on the United Nations Human Rights Council. Protest against Trump continued during his trip to Scotland. Organizers say 60,000 protested Trump in Edinburgh, and during his golf round he was booed by demonstrators gathered at the perimeter. 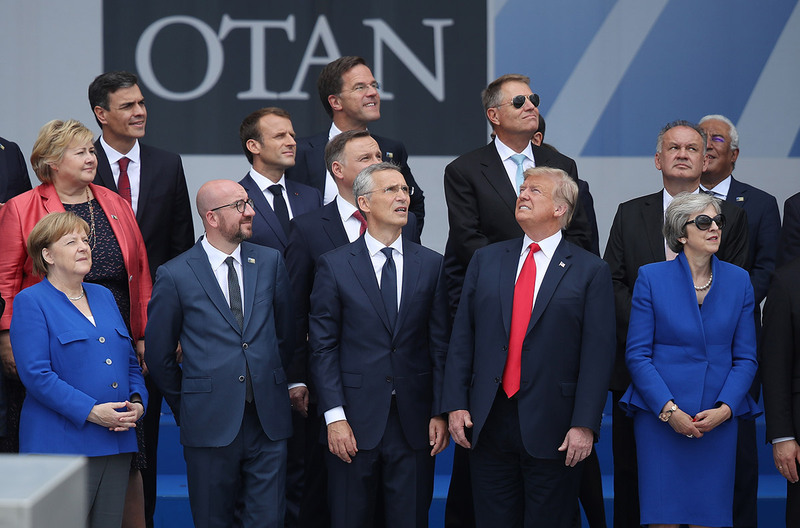 World leaders attend the opening ceremony at the 2018 NATO Summit at NATO headquarters on July 11, 2018 in Brussels, Belgium. Leaders from NATO member and partner states met for a two-day summit, which was overshadowed by strong demands by Trump for most NATO member countries to spend more on defense.